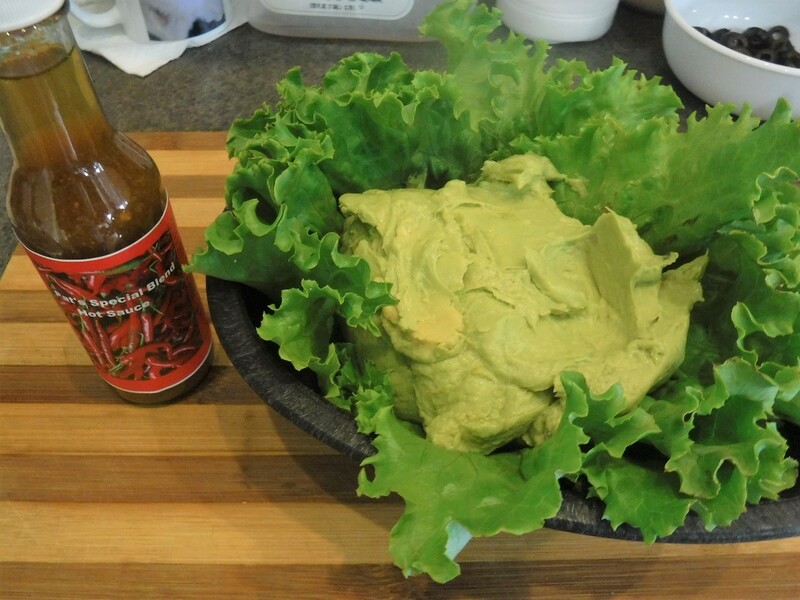 No section on southwestern-style foods would be complete without a recipe for guacamole. 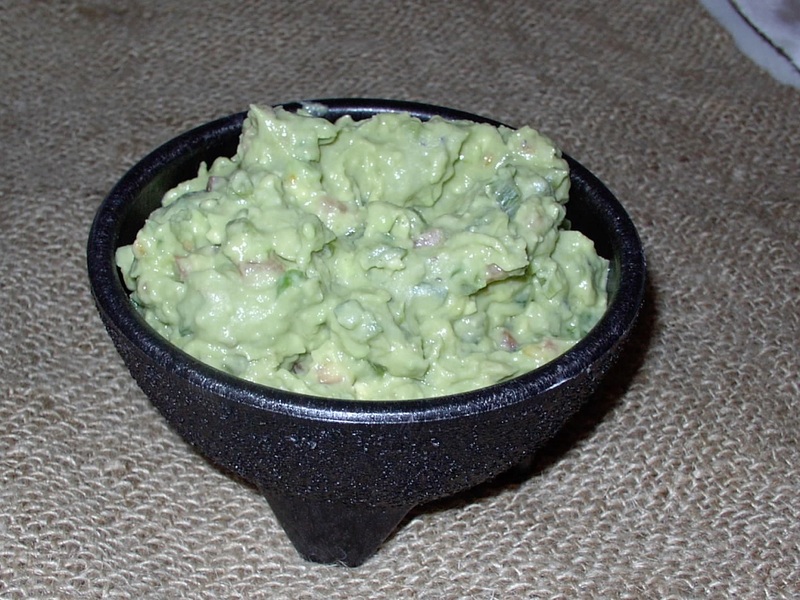 Often guacamole is relegated to the role of chip dip but it is a valued seasoned sauce for many Latino inspired dishes. After all, what fajita is complete without a slathering of sour cream and guacamole? Fresh avocados aren’t always available. Early season avocados cost so dearly that you cringe at the though of mashing them. Those are the times that you have to resort to prepared guacamole. But when avocados are plentiful and reasonably priced, you owe it to yourself to make it from scratch. There is an iridescent quality to the fruit that makes avocado green such a distinctive color. The color of guacamole adds a vibrancy to dishes. It is a color worth preserving. This recipe will challenge your skill with a knife. Part of the avocado is mashed, smooth and creamy. Part of the avocado is chunky giving small bites of avocado in the smooth and creamy avocado. 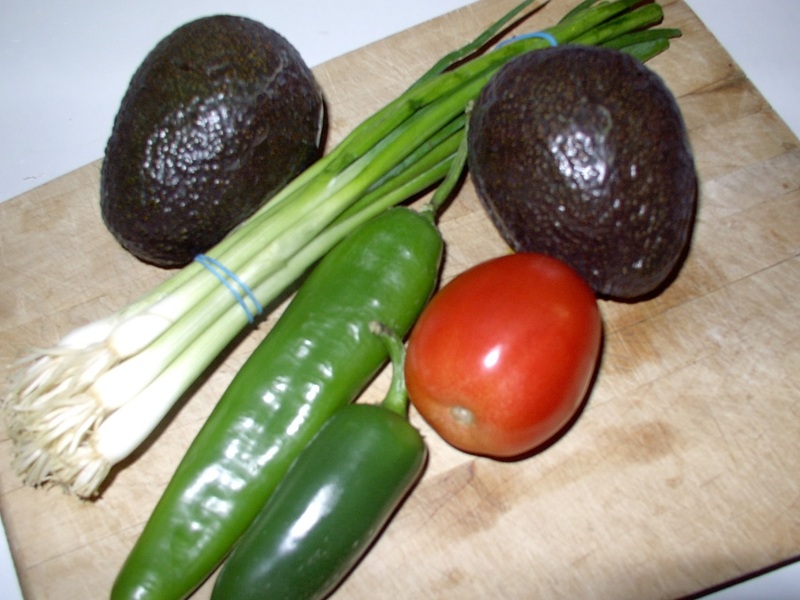 Also mixed in with the smooth and creamy avocado are small bits of tomato, green chili, jalapeno and green onion. Not big enough to make it chunky but just large enough to give subtle differences to the texture, to impart a distinctive bit of flavor but never large enough to detract from the smoothness and creaminess of the avocado. The fine dicing of the tomato and green onion will test your slicing skill. Turn gas burner on high. Place green chilies on the grate directly in the flame. Use tongs to turn as skin chars. 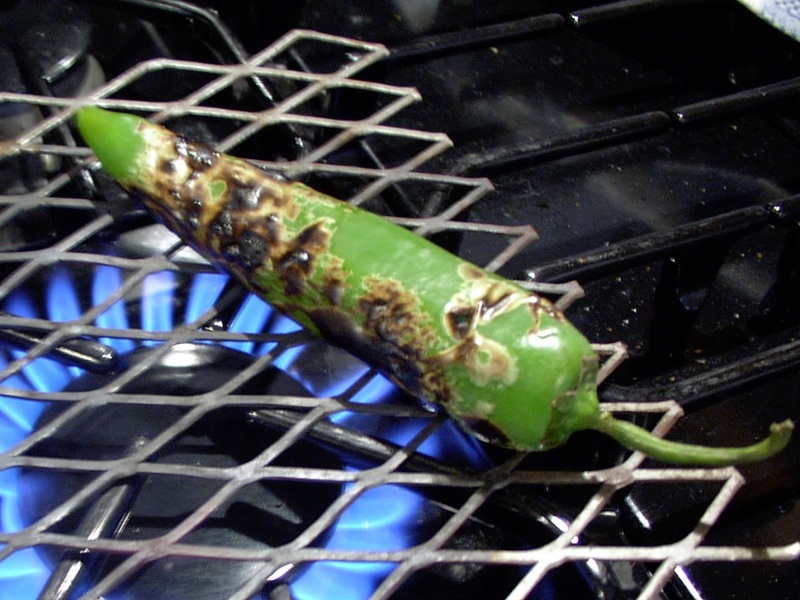 When skin is charred completely around, remove chilies from flame and place in a plastic bag. Close bag and set aside for 15 to 20 minutes. Trim root and greens from scallions. Slice lengthwise to make into quarters. Finely slice to make fine dice. Set aside in colander. Trim stem end from tomato. Cut in quarters, With finger, brush away seeds and the soft meat of the tomato. We want the firm, bright red outer wall of the tomato. Cut into thin strips and fine diced like the green chiles. Set aside in colander. Cut avocados in half, cutting around the seed lengthwise. With each hand holding one half of the avocado, give a slight twist to separate halves. Lightly chop with knife into seed and give a twist to loosen seed and remove. Use spoon to scoop out meat into bowl. Cover with lime juice and toss to coat. Remove about 1/4 of one avocado and fine dice. Set aside. Add salt, pepper and garlic powder to remaining avocado. With masher, crush avocado and work until it is smooth and creamy. Fold in green chilies, scallions and tomato. This is a mild guacamole with out added chili heat. I prefer it for adding to dishes, such as tostadas and fajitas, where the spiciness of the dish comes from the other ingredients. If you prefer a spicier guacamole, such as for a stand-alone dip, use the jalapeno peppers. Trim end. Slice lengthwise to make quarters. With knife, scrape off membrane and seeds. 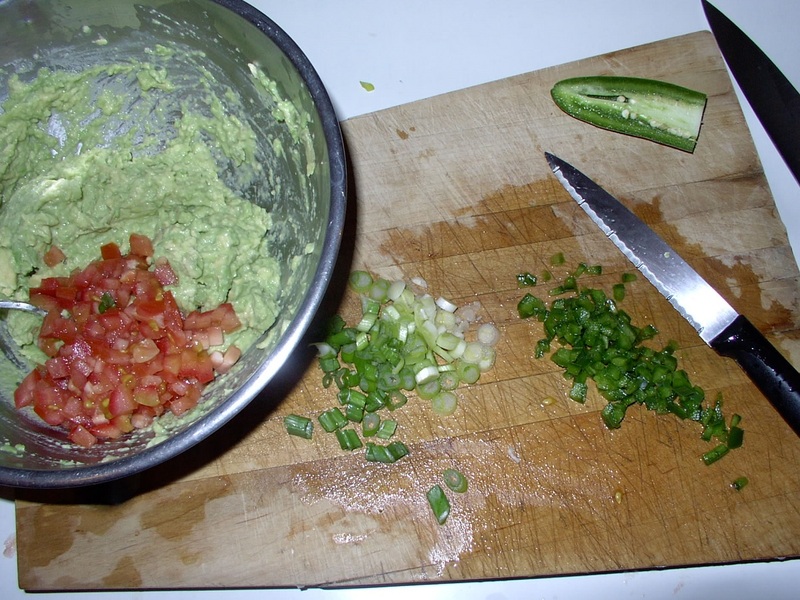 Fine dice and add to guacamole with green chilies, scallions and tomatoes. One jalapeno will make a mild to medium heat guacamole. Place in airtight container and refrigerate 2 to 3 hours before using. Serve as a condiment with tostadas, fajitas, burritos, and yes, even as a dip with tortilla chips.